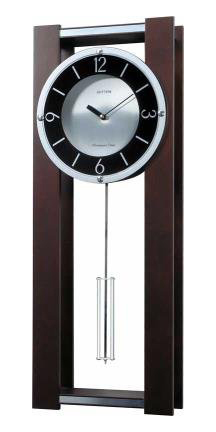 This Handsome Modern Style Westminster Chime Wall Clock called "Espresso" by the Rhythm Clock Company will certainly be a nice addition to a home or office or as a gift. It measures 28.4" high x 10.3" wide and is quartz, battery-operated. Its features include: Westminster chimes, an hourly strike with or without playing of musical selections, Volume Control, on/off switch, demonstration Button, and an Automatic Night-Time Shut-off Feature. Engraved plaques are available and you may select that option at additional cost when you add to cart. Please scroll down to view a selection of songs! "Air on a G String"
"Jesus, Joy of Man's Desiriering"